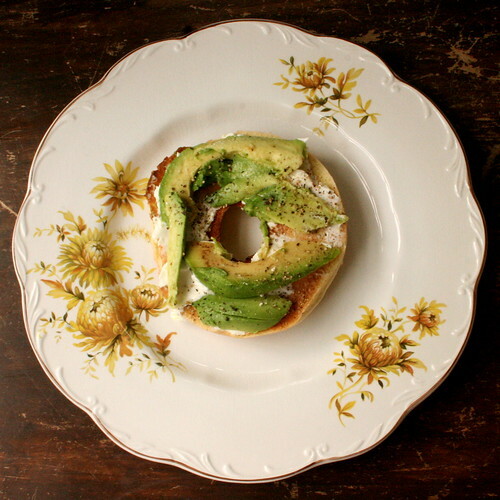 Avocado & Cream Cheese Bagel, originally uploaded by Temeculamom. So do you eat breakfast? I feel guilty, because I have a hard time getting my kids to eat breakfast during the week, no matter what tantalizing goodies I serve up. However, on weekends, when we don’t eat till 9:00 or 10:00, they are happy to dig in to bacon and eggs or homemade pancakes. I, on the other hand, have always been a breakfast eater. I love eggs-scrambled, hard boiled, fried-it’s all good to me, as long as the whites aren’t runny. I do prefer savory breakfasts to sweet, although I love a good bowl of slow-cooked oatmeal with butter, milk and brown sugar. This morning, I had a bagel with light cream cheese and fresh avocado. Delicious and not too terrible sinful. Did you eat breakfast? Tell me about it. ~ by bekaboo on April 9, 2009.
those plates are too pretty. I’m not a big Avo fan but I also love oatmeal I have two cans of the steel cut oats from TJ…i love it with yougurt and berries. I bet troy would love the bagel with avos..big avo fan. Madison HAS to have breakfast immediately when she wakes up, the other I have to forse her to eat something. My husband will eat if someone makes is for him..he is not a big cereal eater. You asked..I delivered. Yep, I eat breakfast (most days, LOL). Yours looks yummy! My favourite breakfast right now is a toasted English muffin, spread with tomato paste, a slice of cheese, sliced tomato, salt & pepper, then grilled. YUMMO! And it fills me up, I am never hungry again until lunchtime (or even later). Your photo is beautiful, I can almost smell it and my mouth is watering. I never used to though. For years all I would have was a coffee and then 4 hours later might toast an english muffin or bagel. Hmm, oh yes, pancakes. This time just with butter and syrop. OK, now I have to go toast something and put cream cheese on it….if only I had an avocado! A lot of my South African friends love avo sandwiches on toast. Creative how you used the curve of the slices (around where the pit was) to match the curve of the bagel (where the hole was).